Waste diversion is measured as a percentage of the total municipal solid waste that is kept from going to the landfill. This includes waste that can legally be sent to the landfill. Regulated medical waste and hazardous waste are excluded from this calculation; however, we make an effort to reduce this waste as well. Diverting waste can be done by reducing the consumption of materials, reusing materials, or recycling. The ultimate goal is to divert 95% or greater of the waste we consume from going to the landfill by the year 2020. In fiscal year 2013, 31% of the waste generated from Ronald Reagan UCLA Medical Center, UCLA Medical Center-Santa Monica, and 200 Medical Plaza was diverted from the landfill. This percentage decreased in 2014 due to a spike in total waste generated and a slight decrease in recycling rates. Our goal is to increase diversion by 12% annually until 2020; however, there will be fluctuations year to year. The medical center’s efforts and those of the university campus are outlined in the zero waste plan. 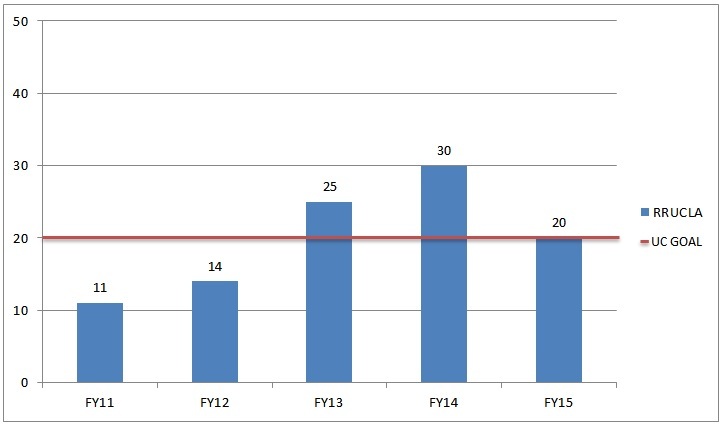 Chart shows fiscal year progress by percentage of waste diversion. Specific initiatives to reduce the amount of waste generated, reuse and recycling efforts can be found on the Waste Reduction and Recycling section. A summary report for FY15 which shows UCLA Health compared to all other UC campuses is also available to view. Food Services and Nutrition is leading the way in the road to sustainability for the health system. Several initiatives have been completed in the past few years. Chart shows fiscal year progress by percentage of sustainable food purchases. The Sustainable Practices Policy outlines very specific goals to increase sustainability within the food systems of the University of California, including the hospitals. Below is an excerpt from the policy on sustainable food. Campuses and Medical Centers shall develop sustainability goals and initiatives in each of the four categories of sustainable food service practices listed below. Each campus and Medical Center foodservice operation shall strive to procure 20% sustainable food products by the year 2020, while maintaining accessibility and affordability for all students and Medical Center food service patrons. 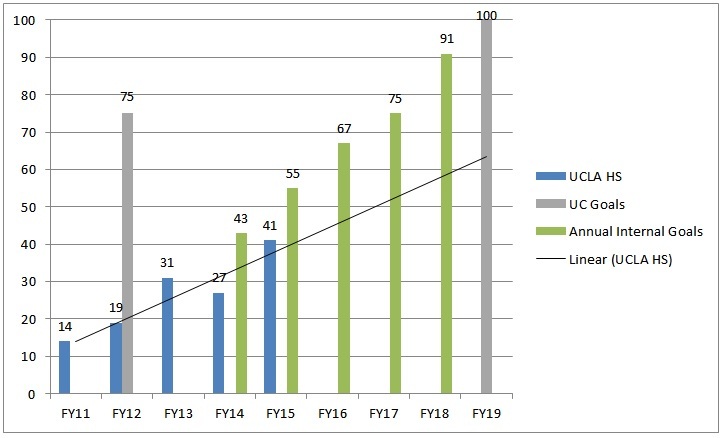 UCLA Health surpassed the 2020 goal in July 2013 reaching 25% sustainable food purchases and continues to stay above 20% sustainable food purchases. To view all the information on the Sustainable Foodservices of the Sustainable Practices Policy, click here. The newest section of the UC Sustainable Practices Policy is Sustainable Water Systems. Campuses and medical centers must reduce water consumption by 20% from a determined baseline by the year 2020. The UCLA campus has reduced water consumption by 5%. This includes all buildings on the Westwood campus that were included in the UCLA Long Range Development Plan. Many initiatives have been implement to help in this reduction. A Water Action Plan detailing initiatives to help achieve the 2020 goal is in progress. ¹ University of California Sustainable Practices Policy, Section III. Policy Text, H1. ² University of California Sustainable Practices Policy, Section V. Procedures, H2.